Nawabshah: The National Commission for Human Development’s (NCHD) Literacy Program is achieving its objectives and targets in far flung areas of the country through the hard work and commitment of its teams. 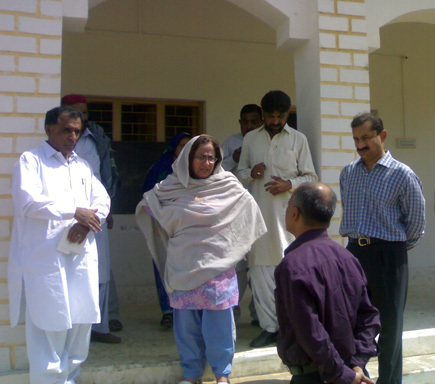 This was stated by Pakistan Peoples Party MNA, Dr. Azra Pechoho during her visit to the NCHD project in district Nawabshah. While appraising the services of female teachers, she said that NCHD is playing a vital role in areas of primary healthcare, education and employment generation throughout the country. Briefing her on the occasion, NCHD’s District General Manager informed that NCHD has reopened 196 feeder schools in the district in the first phase, while 600 more centers would be established in the second phase. She was informed that during the first phase, 15,000 females had graduated from these literacy centers. NCHD is currently operating in all districts of Pakistan including FATA (Federally Administered Tribal Areas), FANA (Federal Administered Northern Areas) and AJK (Azad Jammu & Kashmir). Since 2002, NCHD has enrolled 7.87 million previously out-of-school children (5-7 year old) in primary schools and established over 120,000 Adult Literacy Centers (with 95% learners being female) all over Pakistan. For achieving the 8th Millennium Development Goal (MDG) i.e. “Global Partnerships”, NCHD aims to mobilize the financial as well as intellectual resources of the Pakistani Diaspora. Corporate and various donor agencies like GSK, Shell, Bill Gates & Melinda Foundation, WHO, UNICEF and UNESCO have joined the cause by funding the NCHD programs. Fund raising events are held all over the world, with the major ones in the US through American Fund for Human Development (AFHD), which besides raising funds for NCHD’s activities, also help in promoting awareness of MDGs. Recently, existing PHDF/AFHD board members from the US — Mr. Pervaiz Lodhie, Mr. Najeeb Ghauri and Mr. Shoaib Kothawala — announced their second donation of $100,000 each. It is due to the commitment and support of such expatriate Pakistanis, that NCHD/PHDF has so far succeeded in raising US $ 26 million globally for its grassroots projects in Pakistan.